An Australian Wedge Tailed Eagle out fox hunting in Victoria, a southern State. a very unlucky fox. great image! whole new meaning to a flying fox!!!!!! OTOH seriously, we do have flying foxes here, lucky their diet is mostly fruits. Definitely a lucky shot for the photographer. Pretty crummy luck for the fox. 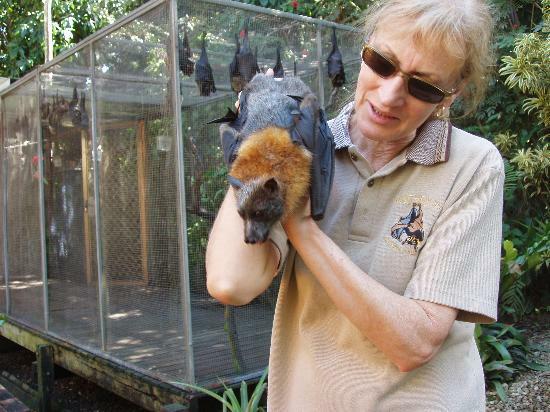 for the non-antipodeans, an Australian Flying Fox a.k.a. fruit bat (one of the world's largest bats) and very common in places (can be pests - but generally protected). I get them feeding in my backyard trees. Drives my dogs nuts, but nice to see around. Thousands of the damn things here in Brisbane mate. Do not touch them or play with them in any way...the carry the deadly Lysavirus. That's a nasty one too! over a two year time period between infection and the onset of symptoms. If you get scratched or bitten you should opt for the antivirus treatment immediately. The form of that virus group that we have in the states is just rabies and the symptoms are usually apparent in under 90 days - compared to your 27 months?!!! That fox-bat thing is an abomination! If I saw something like that flying around here, it wouldn't be for long! You don't just see one fruit bat, colonies usually have thousands and they all take off at sunset and return in the morning and make a hell of a noise and stink during the day. I think Stovey is right on this one. I am not sure I would refer to any creature created by God as an abomination, but I can understand how strange they may seem to us Americans. I wonder what the first folks who saw a rhinoceros, giraffe, or in our case an armadillo thought? Many people eat these critters, saw some in the markets when I was in the Philippines, some fresh and some roasted on the fire. Wish now I had tried it, too late now and I suspect getting back to that part of the world is a little out of my reach today. Still, I suspect Vince's recommendation is prudent, and were I hunting them for a roasted bat snack I would have some serious gloves with me. I wonder what the recommended marinade or sauce for roasted bat snacks is?